Email marketing is one of the most marketing method for online business. If you have an online shop, sending newsletter is a great way of reaching out to your target customers. 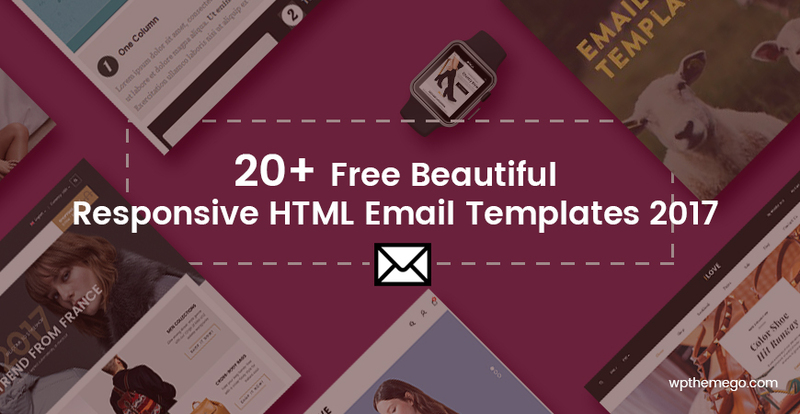 Therefore, this week we offer you high-quality free email templates that work any niche. Let’s enjoy these awesome goodies! First, we introduce you – Passion! This is a simple email template which is designed fully responsive and works on any devices. That means your customers can read your email via their phone or ipad or even making a purchase decision. Besides, it has a minimal and clear design layout to attract your clients’ attention. This is another responsive email template with fast loading speed with the clear design, so you can use this template for your newsletter or promotion event. This is a good-looking email template with warning, blue, orange and warning styles. This beautiful template is suitable for newsletter template, a promotional template and a template for email notifications. This template can be very effective for any purpose like fashion, when you would like to showcase some off your new arrivals, technology and gadgets etc. This free email template is designed by GraphicsFuel which is suitable for those who are seeking simplicity. It will be perfect for bloggers, creative artists, writers and individuals who just want to get their message across, without having to overload the email with ton of elements and complication. For those who don’t want to mess around with complicated frameworks, here is Respmail – a simple responsive email solution that provides you with a modifiable template that you do everything you want. This is the tutorial from Tuts+ called Mastering HTML Email, that will show you how to create a simple responsive HTML email that will work in every email client. It uses minimal media queries and a fluid width approach to ensure maximum compatibility. Once you’ve finished, make sure you validate and test using live devices and a web preview service like Litmus or Email on Acid. This freebie gift from 99designs, including three email templates for newsletter, promotion and personal notification. They come with three different styles and five different colors (blue, warning, orange, red and violet) for a total of 45 options. Green Village is a minimal and beautiful email template that is suitable for multiple purposes. Also, the download package includes both layered PSDs and the HTML source. Finally, we would like to bring you a collection of six simple, yet powerful responsive templates, entitled Email Blueprints from MailChimp. You can use these templates as a solid foundation for designing email newsletters. They do include some MailChimp specific template language elements, but you can be easily removed if you are not a MailChimp user.